A little orange duck has appeared in the bottom right of my screen. He asks, "Can I help" does voice recognition, I think. But it is annoying, and will not go away. How do I discourage this little creature from bothering me? While I don't know why you would like to remove the helpful ducky, here are the necessary steps. Only the last "goodbye" button will set the quack cookie and therefore disable the duck. Keep in mind that you have to accept cookies from cdn.sstatic.net, otherwise the change won't be permanent. But the duck haunts me on other sites! Note that the cookie is site specific. You need to say goodbye on every site you visit. Alternatively, block the https://cdn.sstatic.net/Js/quack.en.js script, which removes the duck entirely from your reality. There is an option to remove this duck after it quacks once. Click on "I hate this duck". It understands and disappears. Solved. Look at April fools info for the tag. It lists "quack exchange" as this year's joke. Other users suggest that adblocker will work on it. For my part, I will ignore the little fellow. We have been suckered. In order to hide it, you have to click "I hate this duck" and "Goodbye" (after it "listens") to make it disappear. However, as mentioned in another answer, you can get rid of it off programmatically using $(".quackoverflow").hide(). But it's still site-specific, meaning it has to be manually dismissed on every site. So I created a userscript (Tampermonkey) to hide it automatically. Alternatively, using an ad blocker (or something else to block the script) also works. Also, Quack Overflow is the April fools joke this year. Click the extension badge in the upper right. Click the sliders icon to "open the dashboard." Switch to the "my filters" tab. 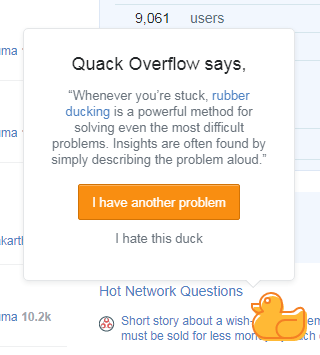 Put ##.quackoverflow in the text box. Click the "apply changes" button above the text box. This affects all sites (including any non-SE sites that name classes quackoverflow for some reason, if they exist). With AdBlock adding stackexchange.com##DIV[class="quackoverflow z-modal ps-fixed r24 js-quackoverflow is-visible"] killed it on every site in the network except SO, where it needs a separate line owing to a different domain. By the way, the Clippy flashback was very much not appreciated, even as April 1st feature. Not the answer you're looking for? Browse other questions tagged support bug april-fools quack-overflow . How do I re-enable Quack Overflow?